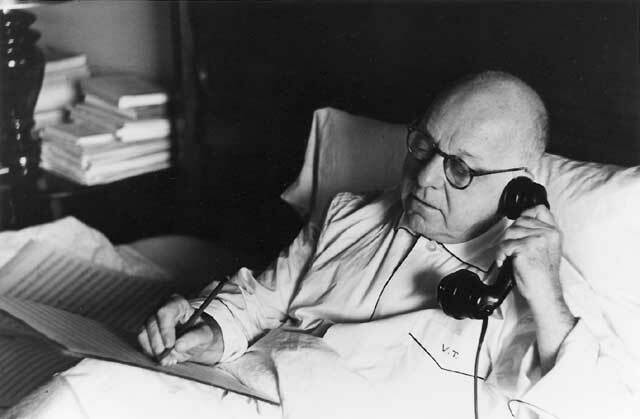 Virgil Thomson in bed in his Chelsea Hotel apartment, by American photographer Mottke Weissman (b. 1923). Courtesy of the Virgil Thomson Foundation. 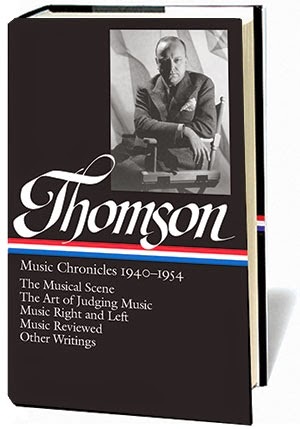 In 1939 Virgil Thomson published his first book, The State of Music, a polemic arguing that composers and other professionals must take control of the creation, performance, and distribution of music or it will become “a mere consumer commodity.” Previously, Thomson had been most famous for his collaboration with Gertrude Stein on the innovative opera, Four Saints in Three Acts, and his book proved to be nearly as provocative and original as the opera. Its stated goal was “to expose the philanthropic persons in control of our institutions for the amateurs they mostly are, to reveal the manipulators of our musical distribution for the culturally retarded profit-makers that indeed they are, and to support with all the power of my praise every artist, composer, group, or impresario whose relation to music is straightforward, by which I mean based only on music and the sound it makes.” Although sales were initially poor, the volume created a sensation among critics, infuriated patrons of the arts, and established Thomson as a wit, a critic, and American music’s strongest advocate. For only such an assumption can explain why a musician so little schooled in daily journalism, a composer so committed to the modern, and a polemicist so contemptuous as myself of music’s power structure should have been offered a post of that prestige. Still more, why the paper kept me on for fourteen years. No other would have done so, I am sure. My editors, during the first two stormy seasons, I know were not wholly happy about their choice. But after that they relaxed and began to purr. My column carried professional prestige; it even, they believed, sold papers. A taste for music, a taste for anything, is an ability to consume it with pleasure. Taste in music is preferential consumption, a greater liking for certain kinds of it than for others. . . . If you don't see the full selection below, click here (PDF) or click here (Google Docs) to read it—free!